Wild yam (Dioscorea villosa) is native to North America. Because it's the root that's harvested, people need to harvest sustainably. Use organically cultivated when possible. Wild yam is one of the heart-shaped leaf plants for which I have an affinity. Something about seeing its whorl of perfect green hearts with deep, defining veins, yellowing in the fall, twirling up trees and over logs, warms my own heart. Favorite places for wild yam to grow in Athens are in Oconee Forest Park behind the intramural fields and at Sandy Creek Nature Center. Over the past few decades, our North American native wild yam vine (Dioscorea villosa) has gained a partially erroneous reputation as a natural progesterone substitute with big-time medical applications. Along with estrogen, progesterone is a necessary steroidal hormone for female reproduction, menstruation and menopause. When estrogen is dominant over progesterone, certain health conditions, such as breast cancer or postmenopausal anxiety and depression, arise in women. This has spurred health care practitioners to sell progesterone cream to balance the ratio. Wild yam roots and rhizomes contain a steroidal saponin called diosgenin that, in a lab, can be synthesized into progesterone. Our bodies, however, cannot convert wild yam into progesterone. Some companies have sold wild yam cream with claims it is natural progesterone. The ingredient list will state whether the progesterone originating from wild yam was made in a lab. By itself, though, without any chemical lab modification, wild yam is a valued medicinal plant with antispasmodic and anti-inflammatory actions. Traditionally wild yam has been considered one of the top five digestive remedies. People prone to spastic, tight pains in the gut – referred to as “bilious colic” in the 19th century, or chronic gastritis associated with heavy drinking – could receive some relaxing relief from a tincture of the wild yam roots and rhizomes. Sympathetic nausea from anxiety also can be assuaged by roots of wild yam. Added to ginger, calamus or chamomile, the tincture of wild yam roots and rhizomes actually tastes nice. For women with predictable uterine pain, wild yam tincture can be taken throughout the month, and combines well with Viburnums, such as crampbark or black haw. Wild yam is considered safe during pregnancy, and is used to calm and relax the uterus. 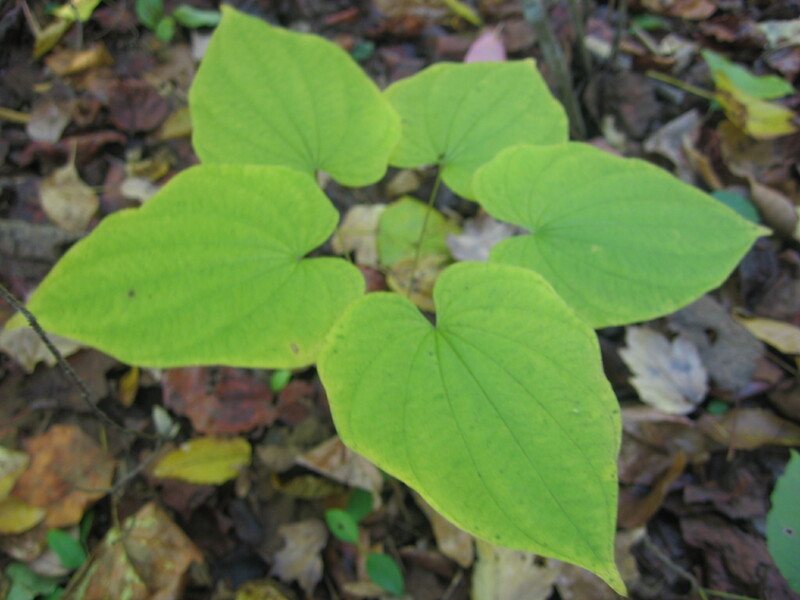 The Meskwaki Native Americans used wild yam as a gynecological aid to relieve women’s pain during childbirth. In China and Taiwan, powdered wild yam roots are used medicinally for their anti-inflammatory effects, which have shown efficacy in reducing postmenopausal anxiety and depression through mechanisms other than the bio-identical progesterone hormone. Wild yam shares the same genus of edible yams, Dioscorea, which is different from the sweet potato, Ipomoea. Some Polynesian and African species of Dioscorea are edible, but our local wild yam isn’t that palatable, unfortunately. This article originally was published in the Urban Forager column of the Athens Banner-Herald, Sunday September 12, 2010.